Oh, where to begin. I was so excited at the beginning of the GOC … for all the changes about to occur, about my regimen. Let me tell you that it exploded immediately. As I stated in my initial goals, I wanted to start regularly hennaing and using castor oil. Yeah, guess who is extraordinarily allergic to both henna and castor oil? This girl. The last henna that I did, it caused a MASSIVE eczema break out down the back of my neck and back. I kind of knew henna irritated my skin a little based on my first henna application, but it was nothing major and I ignored it because I so badly wanted to use it. Bad idea. It looked like I had shingles (I actually thought I had shingles for a minute). Before the outbreak however, I had started using a mixture of castor oil, jojoba, grapeseed and olive oil on my scalp and edges. I did this once and my scalp was so irritated that I had to leave work early to wash it out. I knew it was the castor oil causing the problem because I use the other products routinely. Both the henna and castor oil have resulted in a great deal of shedding. My scalp is so sensitive in some areas (particularly my crown and front/side edges … joy) that I can’t even touch them (Btw, it has been a month since doing the treatments). There are 2 or 3 tiny bald spots ( BALD SPOTSSSS!!!!!) in parts of my edges now. I am so devastated by all of this. The solution I’ve come up with, for now, is to use a wig to do major protective styling for a while. I considered twists or weave, but my edges are so sensitive and the shedding hasn’t calmed down fully, so I did not want anything pulling in those areas. I am also currently in a show (I am an actress), along with working full time, and I would not be able to dedicate myself to my hair the way that I would want. But okay … haha … there is good news. I lost 5 pounds this month! Woot! I would have lost more, but when I’m upset, nothing stands between me and food. Thank the Lord for the gym and dance class. 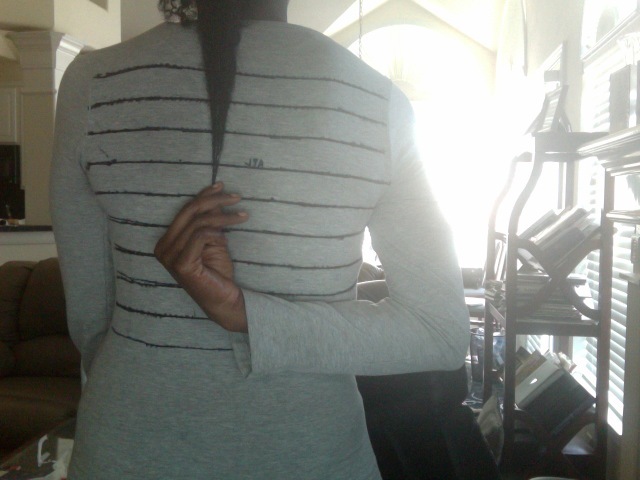 Also, and I think you can tell from the pic, despite the massive shedding, my hair is still growing! Slowly but surely. I was APL starting off and now I am a little over that. So, I am excited to see its progress when I just leave it the heck alone completely. Missed Mimi’s first GOC post? Check it out here. Ohhhh nooooo Mimi :(. I am devastated for you!!!! That is horrible. OMGosh, I don’t even want to recommend anything because, if natural things caused such horrible break outs, anything could:(. I’ve noticed protein helped me with excessive shedding. Inflammation and irritation of the scalp can cause shedding, so you definitely need something to stop that! Do you have anything in the past that you’ve used for scalp outbreaks? If not, I’d suggest going to a doctor for medication, because until your scalp stops hurting and being irritated, the excessive shedding probably won’t stop. Also, I’d just suggest moisturizing and deep conditioning if your hair with products that you already know work for you. I feel so sorry that this happened :(. I hope that you are seeing some improvements now. Ditto! If you scalp is still this inflamed after a month, you should definitely go see a doctor. I hope you recover fully and quickly!!! Good luck on your show!! !